It’s the world’s most expensive coffee, and it’s made from poop. 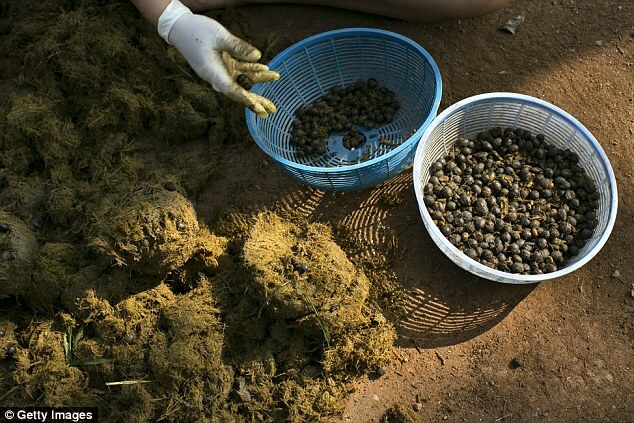 Or rather, it’s made from coffee beans that are partially digested and then pooped out by the civet, a catlike creature. A cup of kopi luwak, as it’s known, can sell for as much as $80 in the United States. Found in Southeast Asia and sub-Saharan Africa, the civet has a long tail like a monkey, face markings like a raccoon, and stripes or spots on its body. It plays an important role in the food chain, eating insects and small reptiles in addition to fruits like coffee cherries and mangoes, and being eaten in turn by leopards, large snakes, and crocodiles. At first the civet coffee trade boded well for these creatures. In Indonesia, the Asian palm civet, which raids commercial fruit farms, is often seen as a pest, so the growth in the kopi luwak industry encouraged local people to protect civets for their valuable dung. Their digestive enzymes change the structure of proteins in the coffee beans, which removes some of the acidity to make a smoother cup of coffee. But as civet coffee has gained popularity, and with Indonesia growing as a tourist destination where visitors want to see and interact with wildlife, more wild civets are being confined to cages on coffee plantations. In part, this is for coffee production, but it’s also so money can be made from civet-ogling tourists. Researchers from Oxford University’s Wildlife Conservation Research Unit and the London-based nonprofit World Animal Protection assessed the living conditions of nearly 50 wild civets held in cages at 16 plantations on Bali. The results, published Thursday in the journal Animal Welfare, paint a grim picture. From the size and sanitation of the cages to the ability of their occupants to act like normal civets, every plantation the researchers visited failed basic animal welfare requirements. “Some of these cages were literally the tiniest—we would call them rabbit hutches. They’re absolutely soaked through with urine and droppings all over the place,” said Neil D’Cruze, one of the researchers. Some of the civets were very thin, from being fed a restricted diet of only coffee cherries—the fruit that surrounds the coffee bean. Some were obese, from never being able to move around freely. And some were jacked up on caffeine, D’Cruze said. Would You Drink Coffee Made With Animal Poop? This adorable tropical mammal possesses a unique quality: Its poop is an ingredient in the world’s most expensive coffee. Additionally, many of the civets had no access to clean water and no opportunity to interact with other civets. And they were exposed to daytime noise from traffic and tourists, which is particularly disturbing for these nocturnal animals. Wild or Caged: Who Knows? All of this for a luxury item—and a second-rate one, at that. Part of what makes kopi luwak so special, experts say, is that wild civets pick and choose the choicest coffee cherries to eat. Keeping civets in cages and feeding them any old cherries leads to an inferior product. Besides, says one coffee expert quoted in an article for the Specialty Coffee Association of America, the trade organization for gourmet coffee roasters and baristas, kopi luwak just isn’t that good to begin with. Although the civets’ digestive process does make the coffee smoother, it also removes the good acids and flavor that characterize a specialty cup of coffee. A captive civet, likely taken from the wild, looks out from a wire cage where it is kept to produce kopi luwak, the world’s most expensive coffee. There’s now no way to tell whether a bag of kopi luwak was made from wild or caged civets. A BBC undercover investigation revealed in 2013 how coffee from caged civets in inhumane conditions ends up labeled as wild civet coffee in Europe. Even Tony Wild, the coffee trader who introduced kopi luwak to the West,warns against it in an article for the Guardian. It has become increasingly industrialized, abusive, and faked, he said. No certification scheme exists to ensure that coffee labeled “wild” is actually that. And other coffee certifiers working to ensure environmentally responsible farming and production refuse to certify any kopi luwak whatsoever. The Sustainable Agriculture Network standards, or SAN, which the New York-based Rainforest Alliance and other well-known coffee certifiers use to issue their stamps of approval, forbid the hunting and capture of wild animals on farms. The prohibition of caged civets is specifically singled out in the SAN guidelines for coffee in Indonesia. UTZ, another major sustainable coffee certification standard, also forbids caged wildlife on farms and will not certify any kopi luwak. Alex Morgan at the Rainforest Alliance, which uses SAN standards, says it’s too risky to certify kopi luwak. It’s just too hard to establish whether the beans are 100 percent wild-sourced or not. This story was produced by National Geographic’s Special Investigations Unit, which focuses on wildlife crime and is made possible by grants from the BAND Foundation and the Woodtiger Fund. Read more stories from the SIU on Wildlife Watch. Send tips, feedback, and story ideas to gwildlife@ngs.org. Follow Rachael Bale on Twitter. Civets Love Organic Smells African civets like to find things that smell strong—such as rotting fruit and pungent pangolins—then mark them with their own scent glands.